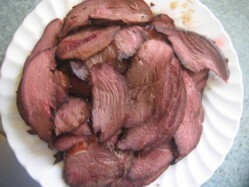 This marinated smoked goose breast recipe, rich in soy sauce and sweet molasses is an absolute delight and with supremely lean meat, goose is a healthy option too. Before the successful intense lobbying by the National Turkey Growers Association to make Turkey our Christmas meal, the traditional bird was goose but hey, why wait for Xmas? You can no doubt see from the picture above that goose meat is nothing like that of either chicken or turkey. It is a much darker meat and more akin to beef in texture and like beef can be served medium rare. The main season for fresh goose is September to December although a limited amount may be available at other times of the year such as Easter. “Don’t like goose – it’s dry and tough” I hear folks complain. Well you’ve never had it cooked this way then. The marinade below succeeds in adding bucket loads of flavour together with a little chili kick and at the same time serves to keep the results beautifully succulent. In addition and as an extra insurance policy, smoke it on a pre-soaked cooking plank over a water bath. Soy sauce is brewed from soya beans and also contains gluten. Mix the soy sauce and molasses in your marinade bowl and stir in the brown sugar. Spoon in the chili flakes and ensure that everything is fully mixed and the sugar dissolved. If you warm the marinade to help dissolve the sugar then make sure that you have refrigerated and cooled the marinade before adding the goose breast. Marinate the goose breasts overnight making sure that the meat is fully immersed in the marinade. Refrigerate throughout the marinading process. When you are ready to cook, remove the goose breasts from the marinade, rinse them and allow them to hang dry for about 30 minutes. Set your smoker up for indirect cooking at 110°C or 225°F and insert a water bath using hot water from a kettle underneath the cooking grid. Place the goose breasts on a pre-soaked cooking plank and smoke them for approximately 90 minutes. You can serve goose breast safely at 60°C (140°F), it'll still be pink inside and it will be lovely and juicy. When cooked allow the smoked goose breast to rest for 15 minutes and then slice generously on the diagonal and plate up.